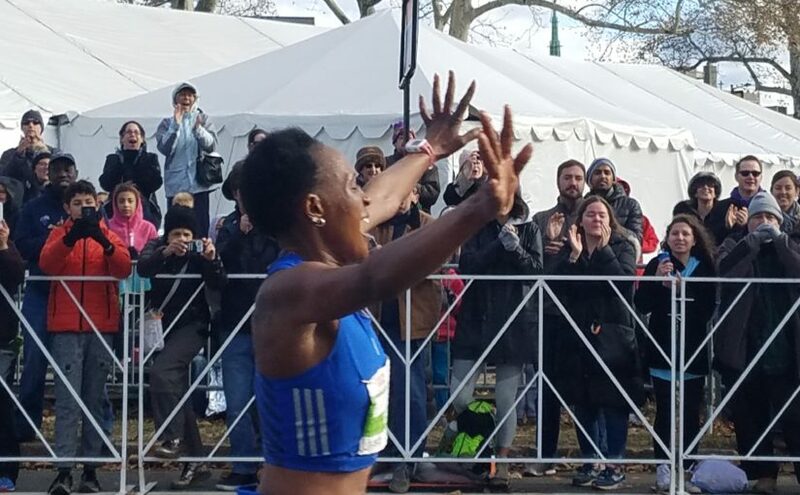 Sarah Kiptoo one second before crossing the finish line of the AACR Philadelphia Marathon, with a time of 2:38:14, became a Facebook favorite. Like many communications consultants before us, “social media” was part of our Statement of Work on a very recent government engagement, and at the start of the contract earlier this year, it was relatively undefined. As experienced healthcare communicators, SPRYTE has been the health system spokesperson and we’ve used earned media, not paid advertising, to deliver bodies to programs from scientific thought leadership panels to high profile entertainment fundraising. Little did we know what joy we would personally experience and how well our public relations background had prepared us for taking the reigns as the voice of one of America’s top 10 marathons! That’s right. Beginning on the eve of the 2017 AACR (American Association for Cancer Research) Marathon Weekend, SPRYTE Communications became @philly_marathon on Twitter and the lead responder on the Philadelphia Marathon Facebook page. We’re still sending love to triumphant runners by retweeting and liking their photos with words of encouragement and by answering their questions about times, medals and shirts. But what we found so electrifying was the power of the message in the moment during Marathon Weekend. SPRYTE was blown away by the reach and engagement of our messaging but we were also humbled by the giant responsibility we had as a guardian of the more than 25,000 registrants and an army of Philadelphia City personnel and volunteers. And by the way, we didn’t delegate to juniors. Everything was handled on-site by pros with more than 25 years in the communications workforce. We may need our reading glasses while composing copy on a smart phone but rest assured, there are no typos and our extraordinary storytelling skills combined with our consumer brand-building expertise really delivered. Giving Prime Time Exposure to the Presenting Sponsor: We gave continued exposure to 2017 Marathon Weekend presenting sponsor, the American Association for Cancer Research Foundation, throughout the weekend. On behalf of the Philadelphia Marathon and the City of Philadelphia, we leveraged our social media channels to thank the AACR for their cancer research mission and their partnership for the Marathon. AACR Foundation Executive Director Mitch Stoller ran the Half Marathon on Saturday and presented the Marathon medals on Sunday. Check out all the great photos of him that are posted on the AACR Philadelphia Marathon Facebook page. Thanks to our engagement for the 2017 AACR Philadelphia Marathon Weekend, SPRYTE experienced social media management in a new way for our firm. We are smitten and we think we have a lot of potential. Let us know if you agree. We know “We Did It!” How do you think we did?